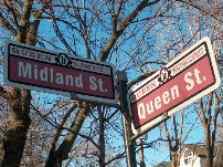 The Queen Street neighbourhood has been subject to historical development that can be significantly associated with the Merritt family. The Niagara Peninsula saw considerable economic growth after the construction of the first Welland Canal, a project initiated by William Hamilton Merritt, a prominent land owner. The subdivision of his family's estate in 1868 created the Triangular Tract, a new residential neighbourhood with an extensive open parcel of land known as Montebello Gardens, later to be acquired by the City as a park. By the 1870s, Queen Street was a thriving residential street while Montebello Park saw the construction of a large pavilion and subsequently a smaller bandstand. It was not until 1913 that families settled into residential dwellings on Midland Street along the park's border. The unique building styles found in this neighbourhood give the Queen Street District a diverse and rich streetscape.